Need for Madness makes its players smarter! Need for Madness is not just another mindless computer game that is fun to play. There is also a large educational aspect to it that is very unique to the game. The game challenges its players to design and build their own content for it. Leading them to be creative and in turn expanding their mind. Content creation includes 3D car modeling, stage assembly/building and graphic design. Through the game's Car Maker program, players are able to fully design their own 3D cars to play with in the game. Making cars teaches designing objects in 3D through the usage of 3D spatial awareness, geometry and mathematics. It also teaches some basic computer coding. Cars get created by initially being drawn on paper with 3D imagination in mind. Once the drawing is complete the coordinates of the vertices of the car drawn get measured along the X,Y and Z axis. These coordinates are then entered into the Car Maker in a form of code which translates into a 3D object. This is explained and simplified for our players in our Car Maker tutorial here, take a look at that tutorial if you wish to see exactly how it works. Through the Car Maker players get the freedom to create whatever objects they can possibly imagine to make it a reality in the game. So far we've seen some very good looking cars created by players, yet we've also seen some very crazy cars created, including insect like cars, ponies and refrigerators. But the game gets away with all of that because, it is, after all, "mad"! The possibilities are endless for the 3D creation in Need for Madness! Through the game's Stage Maker program, players get to construct their own stages completely from scratch. This is done by simply assembling ready made stage parts together. Sounds easy, however to make a stage that is fun to play, that requires some pre-thinking and proper design before assembly. The Stage Makers allows the players to constantly test their stages as they are building them which gives constant feedback about the playability of the stages. Helping them improve their stage construction, which ultimately teaches functional design logic. Through the Stage Maker, the players also get to fully author the coloration of the atmosphere of the stage and add their own soundtrack to it. Which makes every stage a completely different world in itself that is unique to the player's creation. For more details about stage making see the Stage Maker help here. The players also get to create their own 2D graphics for the game! The multiplayer game requires that players design their own logo images for their nicknames and clans. It also requires the creation of artwork for the clan's background image and profile avatar image. So in short, most of the content that is seen and played with in the multiplayer game is actually authored by its players! And the game provides a healthy competitive environment amongst the players to express their creativity and grow/acquire their creative skills in whichever aspect they prefer! Aaron Agius is a teacher in Australia who used our game to get his students engaged in 3D design! 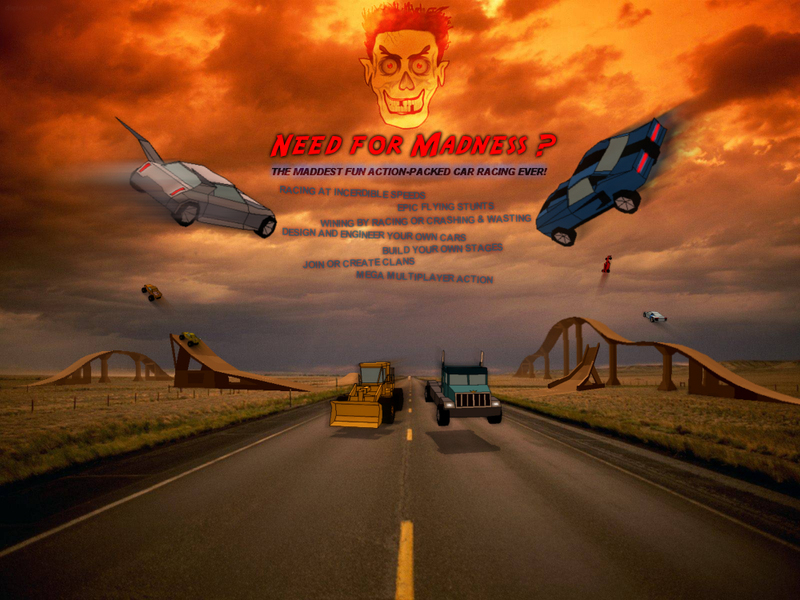 "The two stand out aspects of Need For Madness 1) the ability to create 3D models and then use them in game; and 2) the ability to run LAN multiplayer and have students interact with each other in the game environment make NFM a truly killer application for Education. Another very important factor is the willingness of the NFM team to talk to users and be open to development and modification to help create the best tool for educational use. I am very happy to have found an engaging and fun game like this that I can leverage for educational use."